Rufus' human parents remember life with Amazon's first canine staffer. Thousands of dogs join employees at Amazon’s Seattle campus today, but back in 1996 there was only one: a Welsh corgi named Rufus who roamed the first warehouse and loved meetings. His lasting paw print on the company is much greater than anything his parents, Susan and Eric Benson, ever expected. Susan and Eric Benson, with their dog Scout, at their home in Seattle, WA. When the couple came to Amazon—Eric as one of the company's first software engineers and Susan as the first managing editor—they were among fewer than 20 employees working out of a former janitorial supply warehouse. Prepared for start-up hours, they asked Jeff Bezos if they could plan to bring Rufus to work. His response, Eric recalls, was, "Is he a good dog?" He was a great dog, and today Amazon owes its remarkable dog-friendly culture to Rufus. Though he passed away in 2009, his presence is still felt at the Seattle headquarters, where a building bears his name and photos mark his memory. 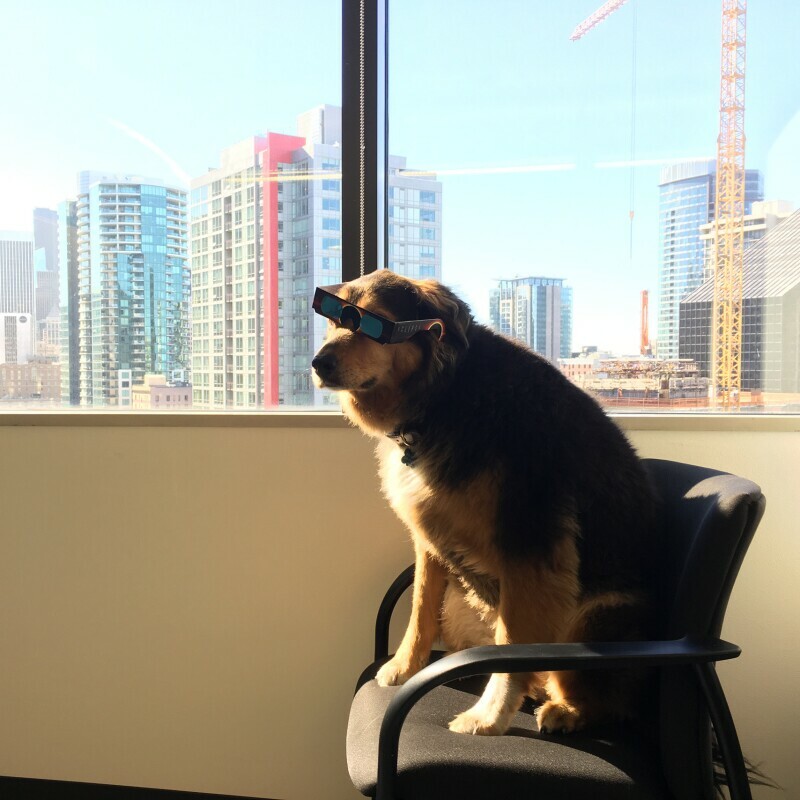 Rufus was already an experienced office hand when he joined Amazon, having worked with Eric and Susan at their previous employer, Netscape. And at the warehouse space in an industrial part of Seattle, having a dog on the premises was no big deal—you could have brought an elephant to work, Susan jokes, and no one would have cared. Rufus wore many hats in his time working at Amazon. Even Stephen King was a fan of Rufus. Rufus once had his very own photo shoot, and became a central character of Amazon's "404" error page. Rufus loved to lie under tables and just hang out. Rufus is memorialized in a stone at the Benson's home in Seattle, WA. The stone was a gift to the Bensons from Amazon colleagues who knew and loved Rufus. "We did recognize, however, that if we didn't go down in flames, we would move to a larger, better building, and Rufus might not be welcome," Susan says. So, when Amazon drew up contracts with new landlords, they made sure Rufus was written in, too. That fit in with the early spirit at Amazon. "Change was constant, and we were kind of just making up the rules as we went," says Eric, who was building the online store from scratch, while Susan was tasked with creating book recommendations and an editorial tone that would convey human warmth across a glowing screen. As the business grew and moved to offices downtown, the new landlords weren't thrilled about having dogs, as the Bensons had predicted. Their early contract ensured an exception for Rufus, but other employees began sneaking in their dogs too. Email messages went out reminding people that Rufus was the only dog allowed—until one day a former finance executive replied, "From now on, all dogs are named Rufus." That response "was a brilliant moment," Susan says. "It was like a wall falling." When Amazon took up residence at Beacon Hill's Pac Med building in 1998, the company arranged to allow dogs as part of the lease. Rufus launched a number of Amazon sites in his days at work. The Bensons stayed with Amazon until 2001, with Rufus a constant presence. He was "a serious beggar," Susan says. "He used to work the offices of people who couldn't help themselves" from giving him treats, even though he was on a diet to protect his sensitive gut. And he loved being under a table where people were talking, even if his parents weren't in the room. "He would just wander into meetings, sit under the table, and be happy to hang out," Eric says. Rufus also became a fixture at website launches, where he served as the official switch-thrower. "You would hover Rufus over the keyboard and drop his little paw down onto the keyboard to flip the site," Susan says. "It was silly and adorable and people loved it." His appearances in press stories and on Amazon error pages eventually made him a celebrity beyond the office; he began to receive presents from customers and got recognized around town. After leaving Amazon, the Bensons pursued political work, handling tech and web communications for a presidential campaign and, later, working for the U.S. Digital Service. In addition, Susan worked for many years with the Seattle community center Town Hall, sitting on its board and helping to raise funds. The Bensons are also strong supporters of marriage equality and LGBT rights and host the annual Lambda Legal Garden Party. "We feel very fortunate to be able to pursue stuff that matters to our hearts," Susan says. "Amazon made that possible for us." 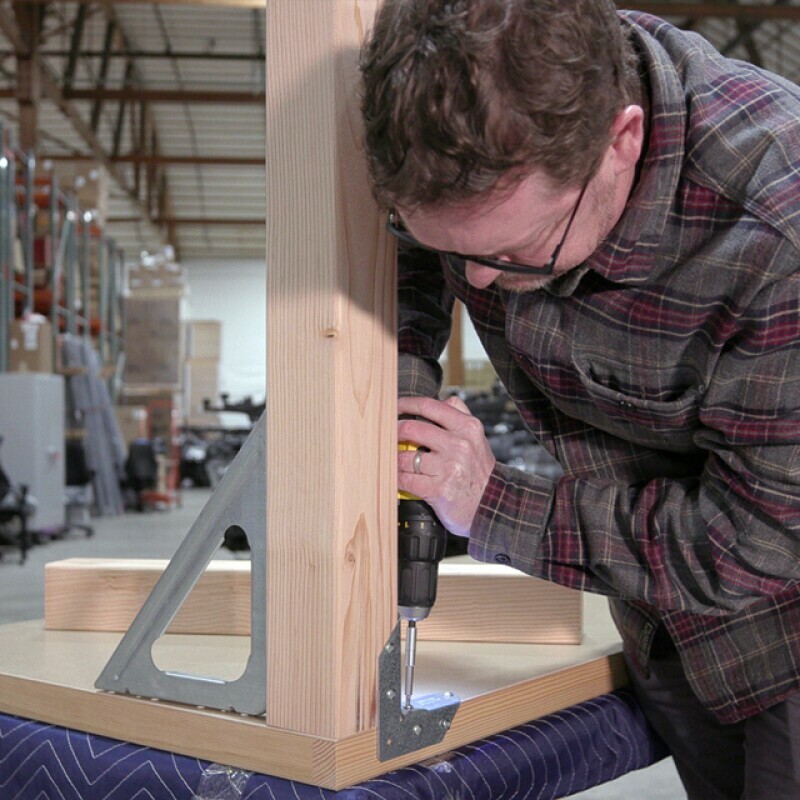 During this stretch, Rufus would still go in to "work" from time to time, because a friend who still worked at Amazon would take care of him while the Bensons were away. "I think it was a little bit hard on him when we retired," Susan says. "He was happier going to work than doing most other stuff." Still, Rufus got lots of love and dog park time when he wasn't seeing his old friends at Amazon, living to the ripe age of 15. In addition to the Rufus building in South Lake Union, he still has his own page on the website where customers can also create profiles of their own beloved pets. "We were very lucky to have him in our lives," Susan says. "He was a remarkable little guy." 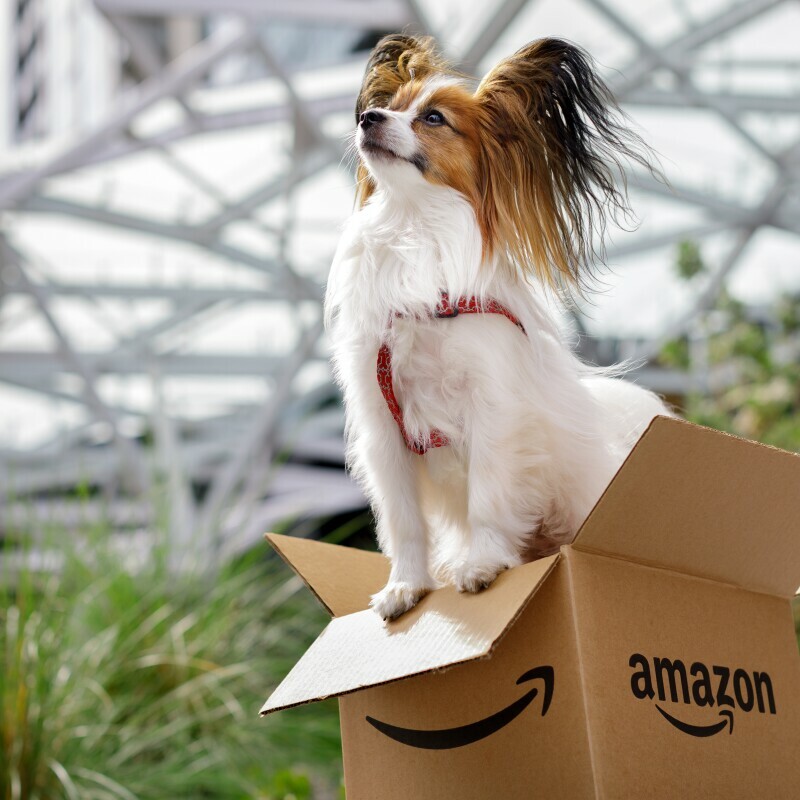 There are over 6,000 dogs registered to come to work with Amazonians in Seattle, with 500 coming in on any given day.